9x12, xi + 160 pp. This edition represents a step towards a full understanding of the development of the string quartet in Italy. Campagnoli’s style has its genesis in the Paduan violin school begun by Giuseppe Tartini. Many of Tartini’s pupils, such as Pietro Nardini, Maddalena Lombardini, and Campagnoli himself, cultivated an interest in string quartets. After Tartini’s death in 1770, Campagnoli continued his studies with Nardini in Florence. 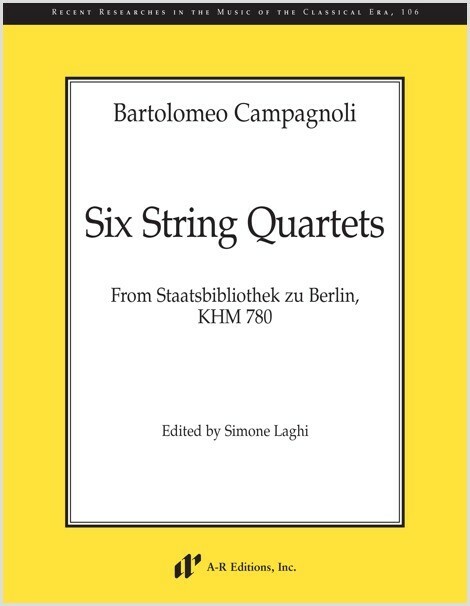 From 1797 to 1818 Campagnoli was principal violin at the Gewandhaus orchestra in Leipzig, becoming one of the most important violinists in Germany at the end of the eighteenth century, a living link between Italian cantabile and German counterpoint. This manuscript was part of the Königliche Hausbibliothek in Potsdam, along with many compositions by Mozart, Boccherini, and Haydn. Consisting of four manuscript parts, it was considered lost until 1997, after the reunification of the music collections from East and West Germany at the Staatsbibliothek zu Berlin. Performance parts are available as separate purchases.